The Ebby Halliday Companies are now part of the country’s largest residential real estate brokerage. Parent company, HomeServices of America, a Berkshire Hathaway affiliate, has earned the title of the country’s largest residential brokerage in the newly released REAL TRENDS 500. 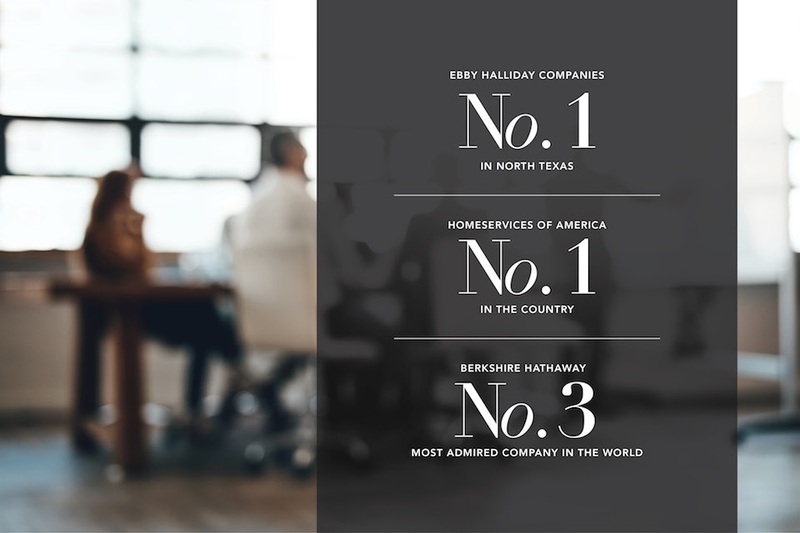 The Ebby Halliday Companies include Dallas-based Dave Perry-Miller Real Estate and Ebby Halliday Realtors as well as Fort Worth-based Williams Trew. In 2018, HomeServices’ sales associates closed 346,629 residential transactions reflecting a 5.6 percent increase over 2017. The REAL TRENDS ranking is based on 2018 closed transaction sides for the country’s top 500 brokerages. In addition to the brokerage services offered by Ebby Halliday Realtors, Dave Perry-Miller Real Estate and Williams Trew, Ebby Halliday’s affiliated companies include Home Team Mortgage, Home Team Insurance and Texas Premier Title, offering buying and selling clients a convenient, one-stop residential real estate experience. In addition to HomeServices being named No. 1 and the Ebby Halliday Companies’ status as the No. 1 residential real estate brokerage in Texas, Berkshire Hathaway was recently named the No. 3 most-admired company in the world by Fortune. It’s truly a great time to be part of the Ebby Halliday Family of Companies! To view the complete list of REAL TRENDS rankings, click here.